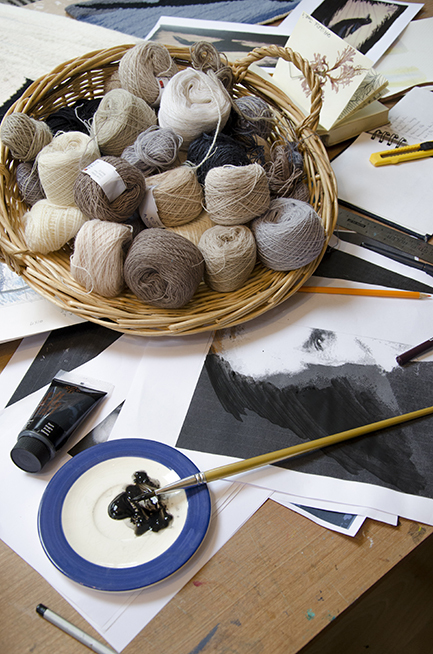 Frances Crowe is a renowned fibre artist based in rural Co Roscommon in the West of Ireland. 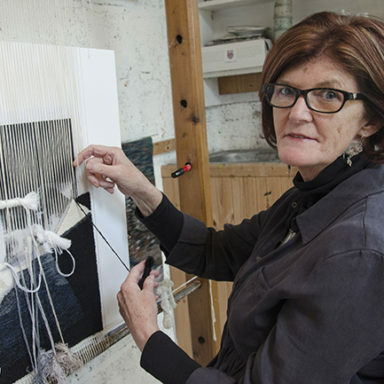 Frances is among the many West of Ireland artists featured in the “Connaught: Facing West” exhibition opening tonight (20 July) in King House, Boyle until 18 August as part of this year’s Boyle Arts Festival. 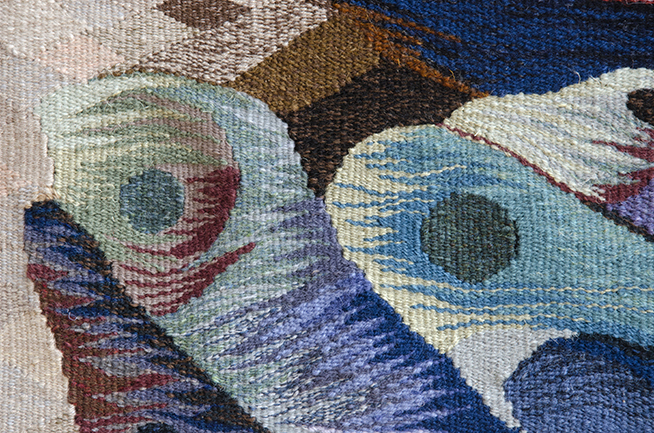 Her work is also currently on display as part of the “Thread Song” exhibition of textiles commemorating the life and work of the Nobel prize winning poet W.B. Yeats @ glór in Ennis, Co Clare until 29 July. 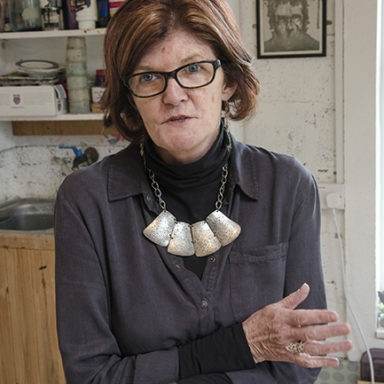 Frances studied Fine Art at the National College of Art and Design in Dublin in the late 1980s with a focus on painting. 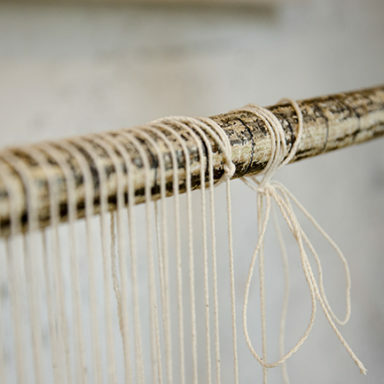 ‘I discovered weaving totally by accident and fell in love’, says Frances. 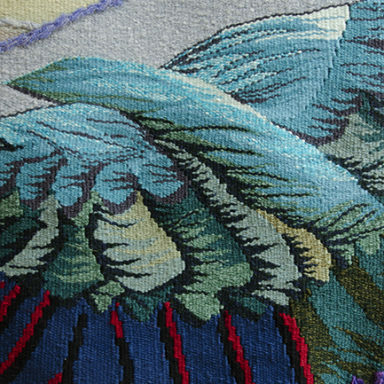 ‘I knew I was hooked the minute I started weaving.’ Frances designs and hand weaves wall tapestries in the age-old, time-consuming Goblin method. She has been practising her art form for over 30 years. 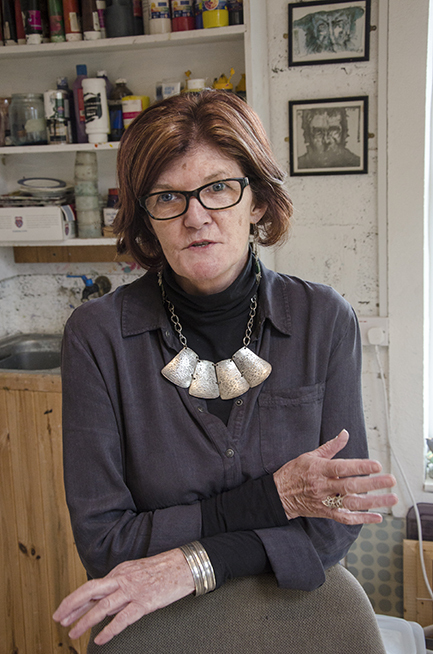 ‘When I got married, we moved to county Roscommon and, like many art graduates, I began teaching, working in Castlerea. 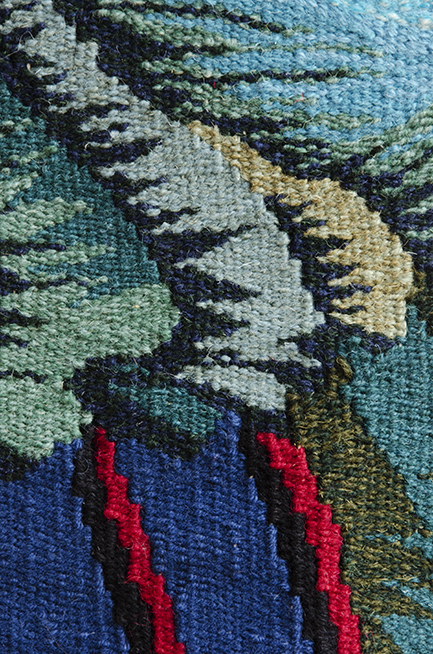 I still pursued my weaving in the evenings and weekends throughout the 80s and 90s, doing some large-scale commissions. The government’s Per Cent for Art Scheme was great, as architects were looking for large scale pieces for new public buildings. I also got a large commission for a new Shopping Centre being built in my native Waterford,’ says Frances. 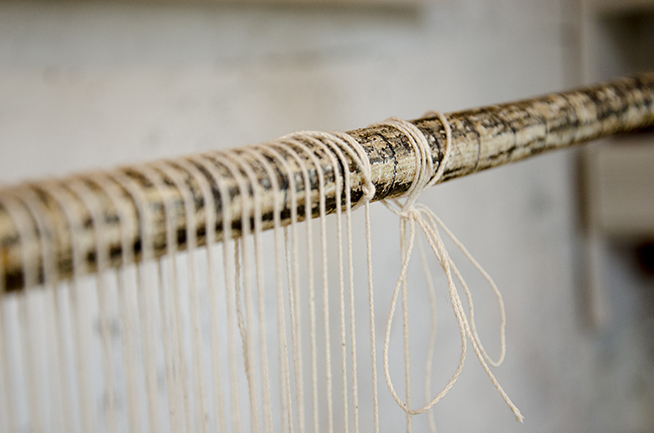 Throughout these years Frances was balancing teaching, raising a family and weaving. Then the economic crash came in the mid-2000s and all large-scale commissions, public and private, disappeared. In response, Frances decided to develop a new side to her business. 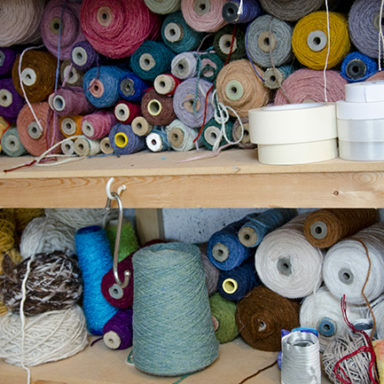 She built a studio at her home, the Grange Studio, and began running workshops and classes for private individuals and organisations. 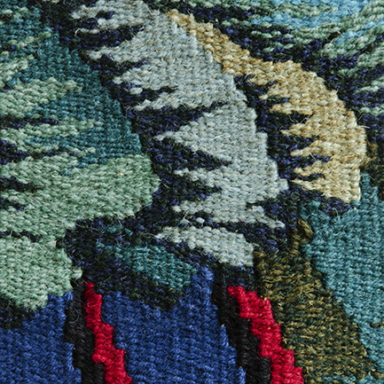 ‘I also began to look internationally and started to collaborate with a group of Scottish tapestry artists. 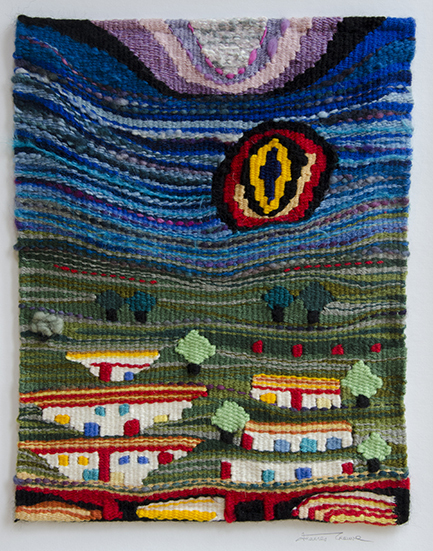 There are quite limited opportunities to exhibit tapestry in Ireland and it was great to make the Scottish contacts. 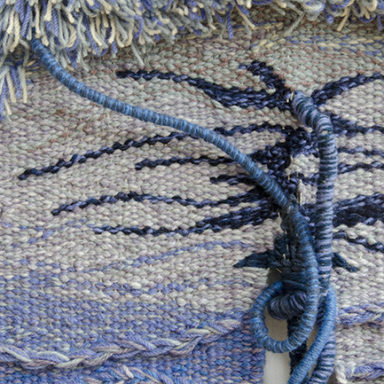 In 2016, I curated “Interconnections 1” an exhibition of woven tapestries including the work of 10 Irish and 6 Scottish weavers, held in Roscommon. We plan this to be a bi-annual exchange and I’m currently planning the 2018 exhibition titled “Interconnections 2”. I have finalised the Long Hall in King House as the venue for April 2018, we hope to tour to a number of galleries and bring it to Edinburgh,’ adds Frances. ‘I’ve actually been much more successful at exhibiting outside of Ireland. 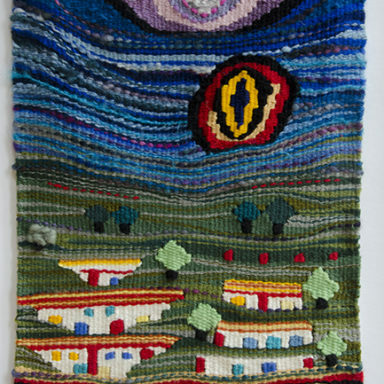 I exhibited at the ‘International Fibre Arts Festival’ in Shenzhen, China last year. I am the only Irish artist ever to be selected to exhibit at the Festival. I was able to travel to China to attend the exhibition opening and symposium, which was a great experience. 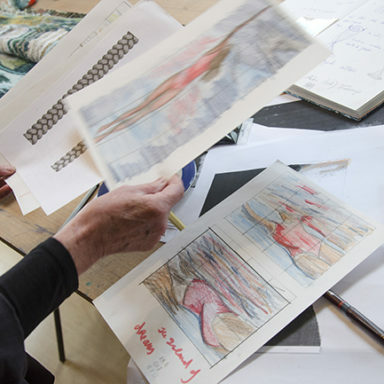 I have also been accepted for an exhibition in Uruguay, I will not attend, but will send my work out,’ says Frances. 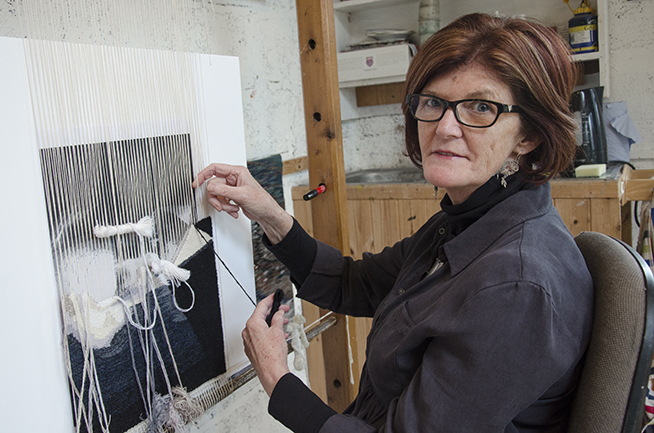 Frances is a member of “Contemporary Tapestry Artists Ireland”. 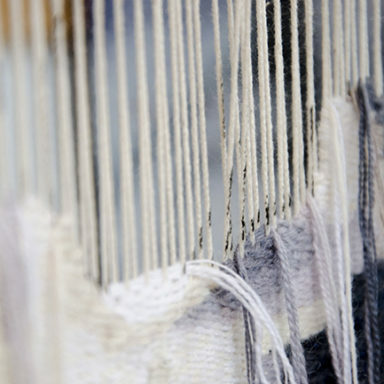 ‘There are currently only eight tapestry artists working professionally in Ireland. 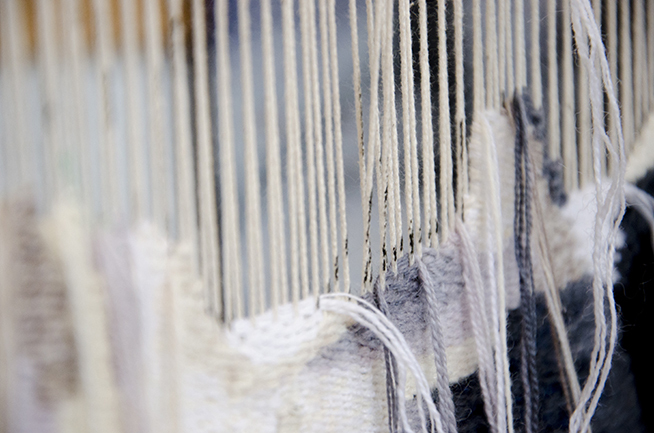 There is no tapestry weaving course offered in any Art College in Ireland anymore. 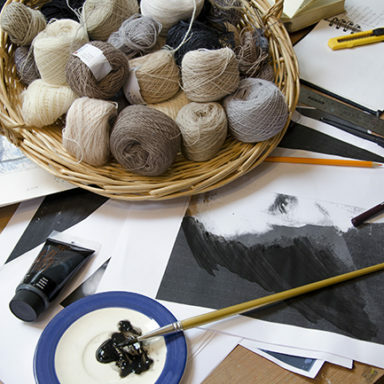 The College of Art in Edinburgh is very strong in this craft and it’s also strong in the Nordic countries of Norway, Sweden and Denmark. There is also quite an established tradition in Central and Eastern Europe. I am really interested in connecting with these countries as the sector in Ireland is very small,’ she adds. 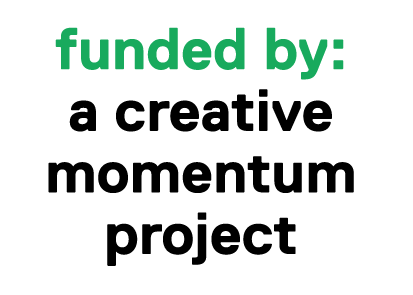 Frances therefore applied to the Creative2Creative Matching programme run by ‘a creative momentum project’ and has been matched with Margareta Sörlin, a Swedish tapestry artist. They will be facilitated to work together online for a 6 month period to share experiences and build connections. ‘I get huge inspiration from my location. The landscape of Roscommon; the ploughed, undulating fields, and rugged terrain. I’m always taking photos of the landscape, when something catches my eye. 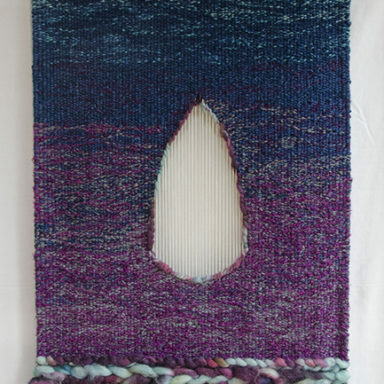 Last year I did a lot of work based on ‘reflections’ inspired by the river Shannon which flows through the county and the reflections of boats on the river,’ says Frances. ‘I am currently starting work on a major body of work inspired by the idea of the movements of people being driven around the world. Famine driving people out of Strokestown in Ireland during the 1840s; Syrian refugees fleeing their home and coming to Ireland in the 2010s. The idea of having to move; being forced to move. 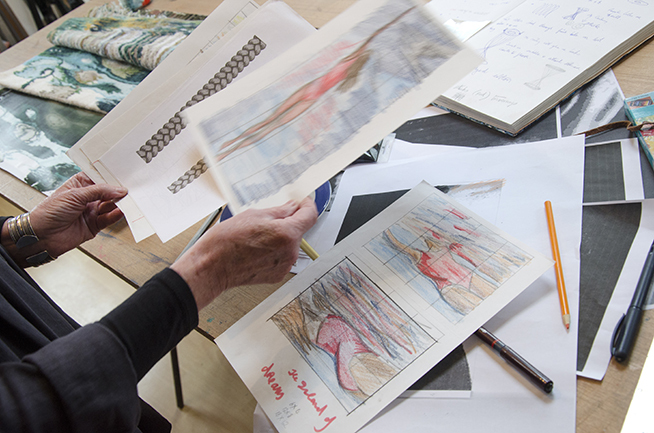 It is a substantial body of work and will take about 2 years to complete with a major exhibition on completion. 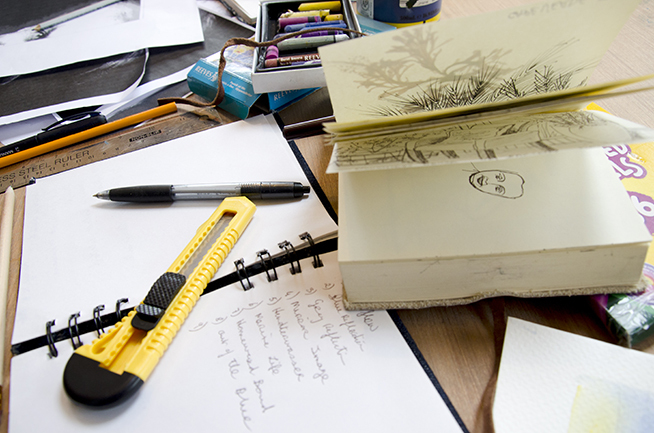 I won’t show any of it until it is completed as a full body of work,’ she adds. 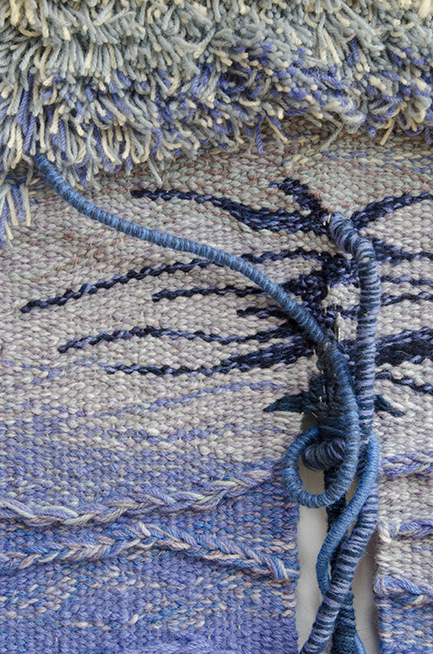 ‘At the core of this body of work, will be a very large-scale woven tapestry that will take about a year to complete. 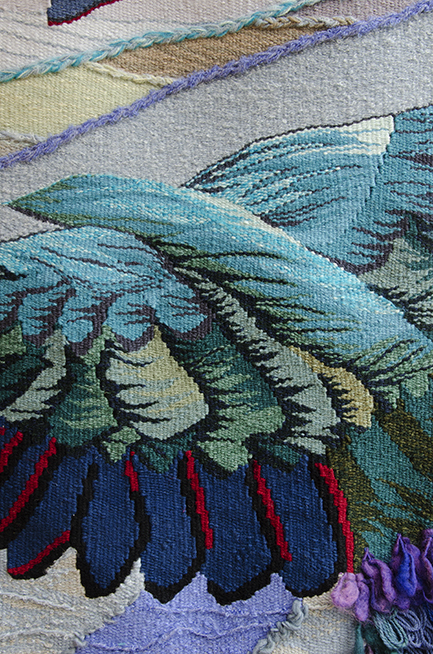 I want to film it over time, using timelapse, to really show the full process of its creation. 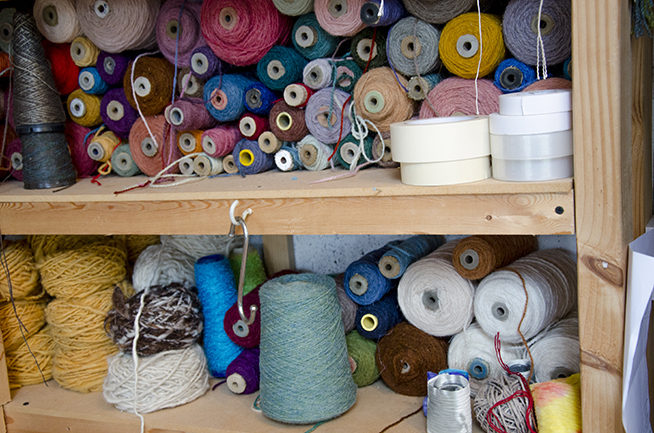 I have a large homemade tapestry weaving frame that takes up most of my studio. My husband made it! 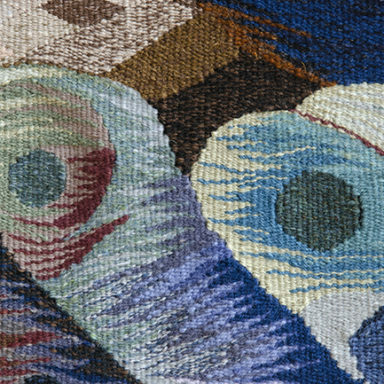 Some people don’t understand the process of tapestry or how it works, they can mix up the different types of fibre art, so I love to be able to show how special and unique the tapestry process is.’ Frances has just had a video produced by Keith Nolan Photography showing the process and the setting up of a recent exhibition of her work. ‘Only in the past ten years have I begun to really promote myself. Making it easier for people to find me and my work. For example I was recently contacted by someone who was preparing a book, an anthology for the Strokestown International Poetry Festival, who found an image of my work online titled “Songs sung and stories told”. They got in touch about using it on the book cover. They searched online for ‘Roscommon Artists’ and found me. The book has just been published,’ she adds. Frances was one of the creative enterprises from the Western Region of Ireland who recently received support from ‘a creative momentum project’ for a professional photoshoot of her work and process. The shoot was undertaken by David j. 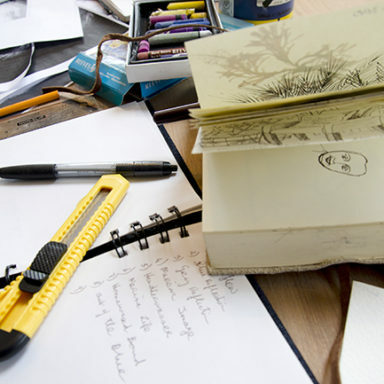 Pierce of Black Hole Studio in Frenchpark, Co Roscommon.